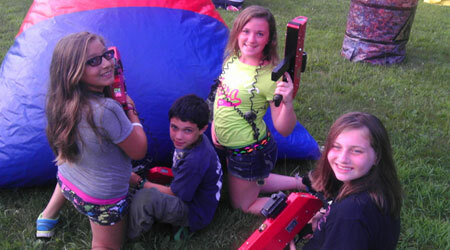 Birthday Party Fun from Outdoor Laser Tag, USA - Leading provider of Mobile Laser Tag for Birthday Parties, Camps and Corporate Events! Tired of the same old party? 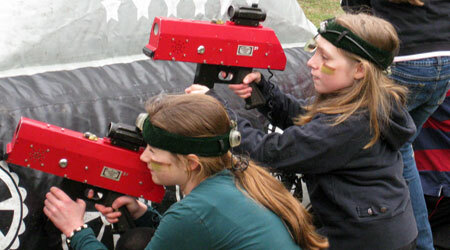 Outdoor Laser Tag is an action-packed, fun, memorable party experience, using a unique hi-tech system from Battlefield Sports, where you not only play the game, you Live The Game! 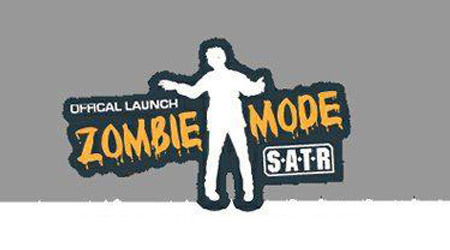 You and your guests will look forward to this party, love playing it and will talk about it for some time. We are 100% mobile. We will Bring The Fun to You! We offer party packages to meet ALL budgets for a minimum of 10 players from age 7 and up. 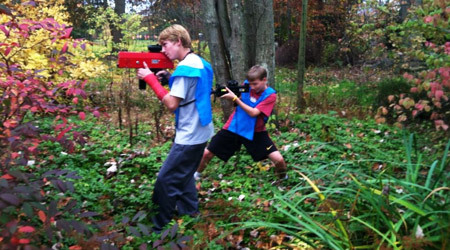 This is NOT like an indoor laser tag party -- there is no foul odor or germs from vests. 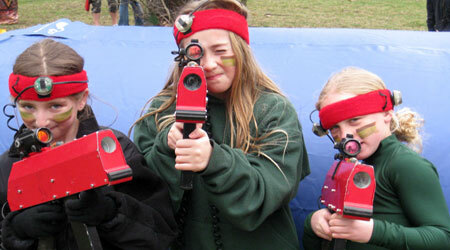 This is good, clean, outdoor fun -- this is Laser Tag in the 21st Century! If you have an environment that's ready for play, great! 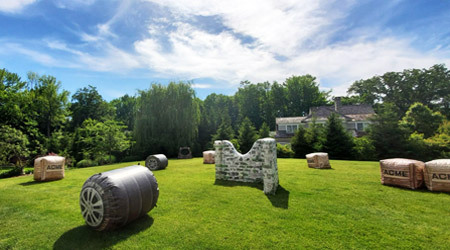 If not - we will bring our inflatable obstacles and Camo Pop-up Forts to construct your customized Mission Field on your property (hard surface or grass). You can choose to either RENT our equipment and manage the event yourself, or you can have us RUN the event for you by hiring our Mission Directors. If you have more questions, many of them can be answered on our FAQs Page. 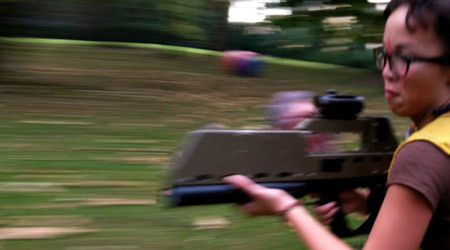 If you have property around your home where we can play laser tag, we will use your natural landscape and existing barriers on your property to play laser tag. The package below does not include our premium inflatable obstacles mission field (see Mission Fields below for add-on pricing). No additional travel charges for events within 50 mile radius of Mount Kisco, NY; otherwise, $1 per mile outside this radius. Camo Pop-Up Mission Field ($125): We set-up a mission field using 8-10 camouflauge pop up tents of various sizes for players to hide in or around. 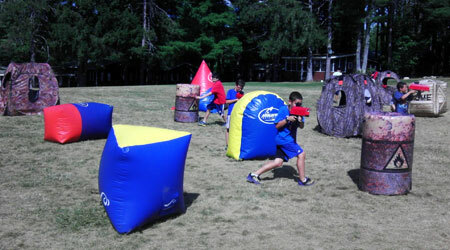 Mighty Paintball Inflatable Obstacles Field & Camo Pop-Up Tents ($295): For the ultimate gaming experience! We arrive at your event 60 minutes prior to the start time to set-up inflatable barriers and obstacles of all sizes and shapes, including Barrels and ACME Boxes for your customized Mission Field. Our staff will use 12-15 inflatables and Camo Pop-ups to create different mission fields and missions, always creating a FUN gaming and party experience!